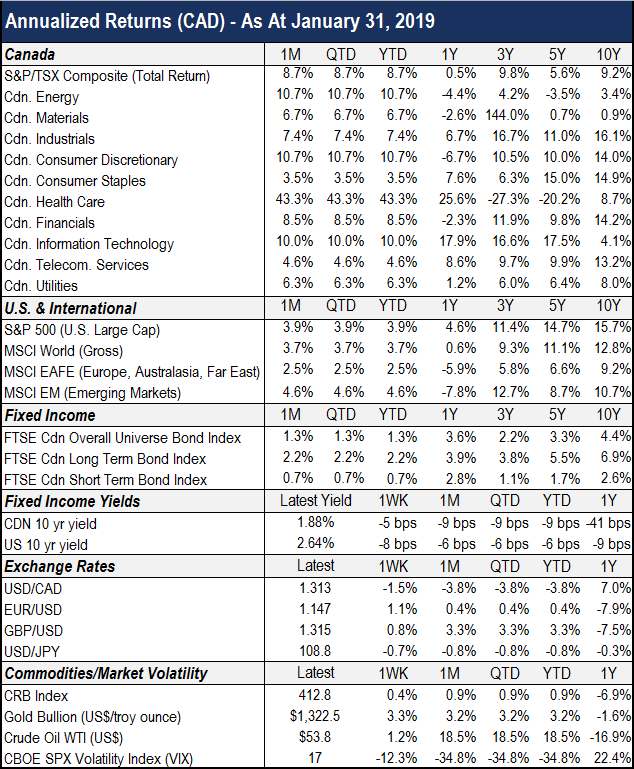 Financial markets began the year on strong footing, rebounding greatly from December’s weakness. In retrospect, the fourth-quarter selloff may have been overdone and likely reflected an overreaction to a modest downturn in fundamentals. While investors remained focused on the same matters that have been dominating financial headlines for some time – including interest rates, trade tensions, U.S. political uncertainties, global economic growth and corporate earnings – the backdrop for financial assets continued to improve last month. On the economic front, January’s U.S. payroll data revealed that growth in the world’s largest economy is still firmly in acceleration mode and that the government shutdown’s impact was minimal. The surge of 304,000 new jobs last month was much higher than expected. Strong U.S. manufacturing data provided further evidence of solid growth. Weaker global demand and the greenback’s appreciation still look set to weigh on activity further down the road, but for January, U.S. economic strength more than offset the drag from overseas. As China and the eurozone have begun witnessing cyclical slowdowns, what remains to be seen is how long the U.S. can continue to be a bright spot. As widely expected, the Bank of Canada and U.S. Federal Reserve held interest rates steady last month. The oil price slump had a material impact on Canada’s outlook; the BoC noting that investment in the sector was projected to decline further. South of the border, the tone accompanying the Fed’s policy statement was more dovish than expected, with Chair Powell arguing that the case for rate hikes had “weakened somewhat” on account of subdued inflation readings as well as receding risks posed by financial imbalances. As a result, yields declined across the entire curve, and the Canadian bond universe gained 1.3% in January. The Canadian long-term bond market outperformed the short-term universe for the month, each returning 2.2% and 0.7%, respectively. Equity markets resumed their upward march last month, helped by a notable shift in Fed rhetoric. Corporate earnings underpinned the renewed uptrend, as results remained in expansion territory – decelerating, but not declining. With over half of S&P 500 companies reporting fourth-quarter earnings, results are ahead of expectations by 2.4%, with 63% of companies exceeding bottom-line estimates. Earnings are still on track to grow for the quarter as a whole, with a portion of the increase attributable to last year’s tax cuts. Major stock markets were positive for the month (in CAD terms), with the Canadian, U.S., international (ex-North America) and emerging stock markets returning 8.7%, 3.9%, 2.5% and 4.6%, respectively. Looking ahead at the balance of 2019, solid earnings and economic data are likely to assist risk assets in delivering further upside, however near-term issues present risks. Slowing economic momentum, an eventually tighter turn in monetary policy and ongoing political tensions are all reasons for markets to remain on edge. Investors are likely to remain skittish until an actual trade deal between the U.S. and China is achieved. However, these risks are counterbalanced by some notable positives, including the pause in interest rate hiking, better-than-anticipated corporate earnings, still solid economic growth and optimism that a China-U.S. trade deal might actually be in the cards. Sharp back-and-forth market action is likely to persist in the coming weeks and months, until investors start seeing clarity on some important subjects.